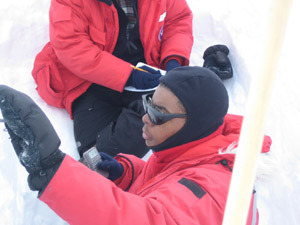 Our team also digs snow pits to look at the upper layers of the ice sheet. Many measurements are taken to help us better understand the ice sheet and to help us make our radars and other sensors work more effectively. The team dug three snow pits and we went with them as they dug the third one. 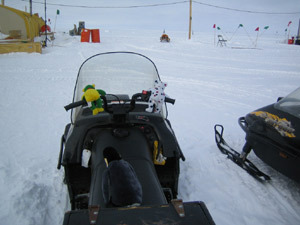 Here I am loading the gear we need on the Nansen sleds. 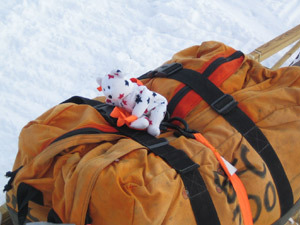 The sleds are named after one of the greatest polar explorers, a Norwegian named Fridtjof Nansen. He developed these sleds for his 1893 try to reach the North Pole from those used by the Inuit people. The sleds, or sledges as he called them, have no nails or screws. They are very light and flexible. 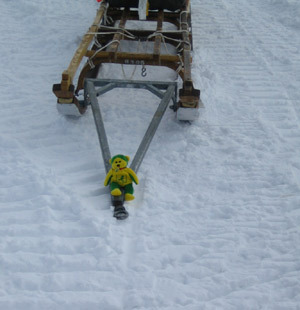 Though many early explorers used dogs to pull their sleds, we will hook ours to a snowmobile. No dogs are allowed in Antarctica any more. This is for the protection of native wildlife. Our friend, Captain Cook, who is a penguin from a classroom in Colwich, KS has joined us for the trip. He wants to ride, while we operate the steering. It's a cooperative effort! That's our science tent in front of us. After digging the pit, which is pretty good exercise, you clean off the layers and put a measuring tape over them. Then each layer is drawn. Dr. Braaten has just about finished the drawings. When you get to the bottom, you have to lie down to see everything. 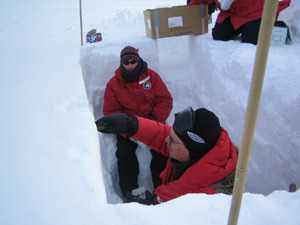 Once the layers are drawn, Joel Plummer and Dr. Braaten take samples from each layer. They use a special instrument that lets them always take the same volume of snow each time. They put each sample in a labeled plastic bag and organize the bags in order from the top of the pit down. 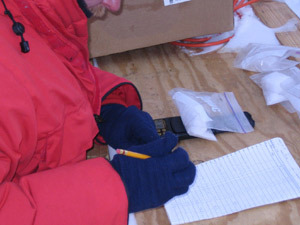 When all the samples are taken, Jerome Mitchell measures and records the temperature of each layer. Then each sample of snow is weighed. By knowing the volume of the sample and the weight, we can use math to calculate the density of the snow. 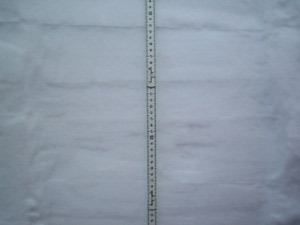 The density of the snow is related to the liquid content or water. 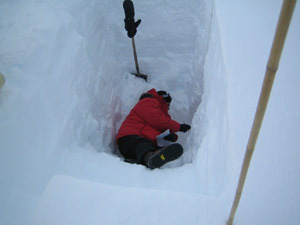 New snowfall is typically less dense than snow and ice that is older and from a lower layer. Higher density snow also can result from warmer temperatures and/or lots of wind. If you have snow in your area, you can use this data sheet to do an experiment that will let you learn about its density.